Live is a versatile tool for composing and performing - you can also use it for DJing, Warping tracks you'd like to play and even isolating different sections of tracks for perfectly-timed mixes. In a new tutorial for AskAudio Magazine, Gary Hiebner explains how to assemble custom Effect Racks in Live, tailored toward DJing and live performance. 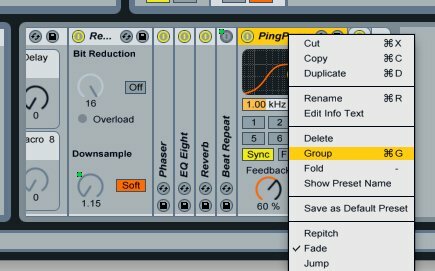 Tips covered include mapping multiple parameters to one Rack macro, nested Racks (Racks within Racks), and more helpful ways to create your ideal effects setup.